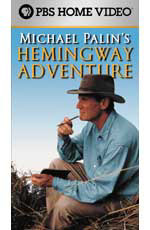 Michael Palin turns his wandering eye to the life and locales of Ernest Hemingway. 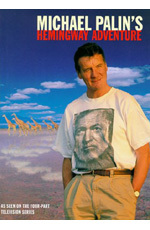 The series moves in and out of past and present to the places that meant so much to Hemingway: Chicago, his birthplace; Italy, scene of his injuries in World War I; Paris; Pamplona and the running of the bulls; his beloved Havana; Key West, where his presence is still felt today; Uganda, where he went on safari; and Ketchum, Idaho, where he died. A look at the life of Ernest Hemingway follows the author of Pole to Pole as he retraces Hemingway's life, from fly fishing in Northern Michigan all the way to Cuba, with 175 color photographs illustrating the journey. Filled with Michael Palin's trademark wit and good humor, this novel is for anyone who has ever dreamed of triumphing over the technocrats and backstabbers of the world. Hilarious, touching, and ultimately inspirational, "Hemingway's Chair" will make readers stand up and cheer. British actor and comedian Michael Palin takes you along on an entertaining journey around the Pacific Rim, traveling by boat, train, plane and helicopter. Meet the Eskimos of the island of Diomede in the Bering Strait. Depart in one of their skin boats for Alaska's mainland, then voyage on to view Russia's western most wonders. Visit Japan's legendary Kodo Drummers, a Zen Buddhist temple, and as a contrast, downtown Tokyo. 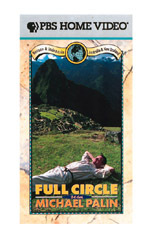 Your itinerary includes the mysteries of China's holiest mountain, a nap in Mao's bed in the Governor's Castle, plus journeys to Vietnam, the perilous Sula Seas, Australia, South America, Mexico and finally full circle back to Alaska. 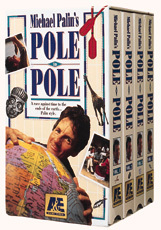 In Pole to Pole join the inimitable Michael Palin (Monty Python) as he travels the globe through hell and high water, blinding snow, blistering sands, bandits, bugs and broken bones in a style all his own. 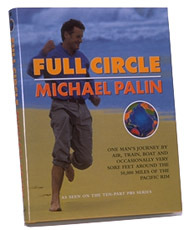 Traveling 23,000 miles, Palin treks from pole to pole, in a way no person has done before. This four-volume set captures Palin en route through some of the greatest lands on earth, from a skinny dip in Finland, to the demise of the Soviet Union. On to Turkey, Greece and the Nile, the halfway point of his trek. He rushes to Cape Town, South Africa where the only ship for Antarctica is preparing to make its one-a-year journey. Will he make it?